Difficulty Notes: Short, loose and exposed notch between the false summit of South Totem and the true summit. Other than that it’s easy scrambling. Note: We combined this peak with Spreading Peak. After a very successful and somewhat tiring 5 day trip with my daughter in which we traveled approximately 57km and over 4500m of height gain, I was ready to put my feet up for the remainder of my week off. 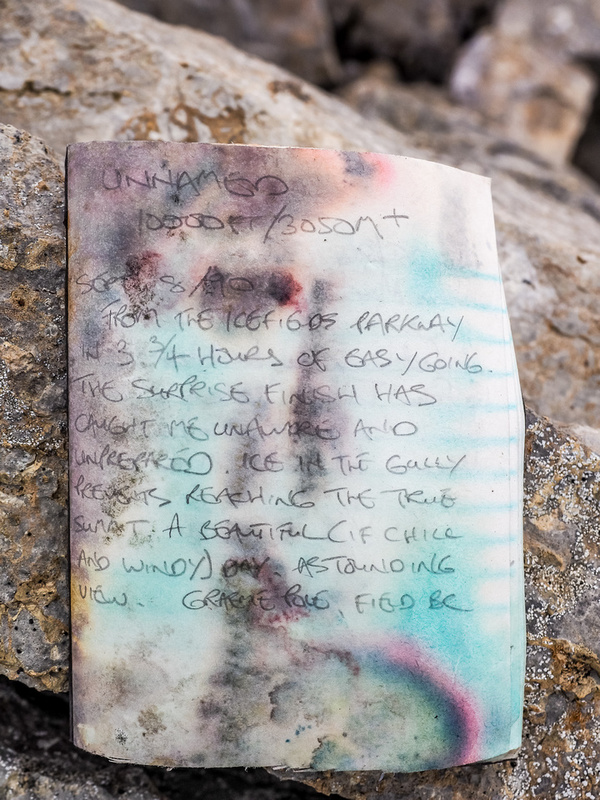 Then Phil texted me… When Phil sends a text, it’s usually some idea for an exhausting day trip involving many kilometers and many hundreds of meters of height gain, usually on an objective that nobody has ever heard of. 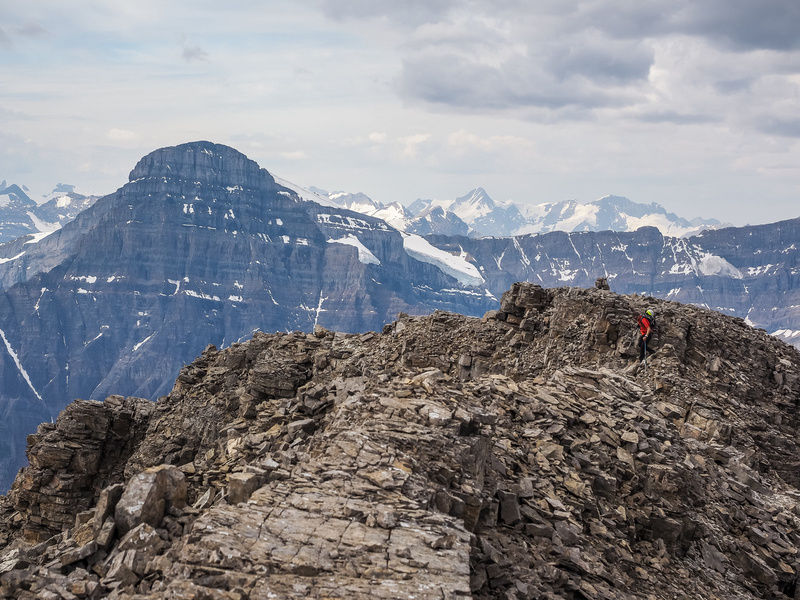 Needless to say, I wasn’t surprised when we settled on a day trip of South Totem and Spreading Peak in the Murchison Group just east of Totem Creek in Banff National Park. 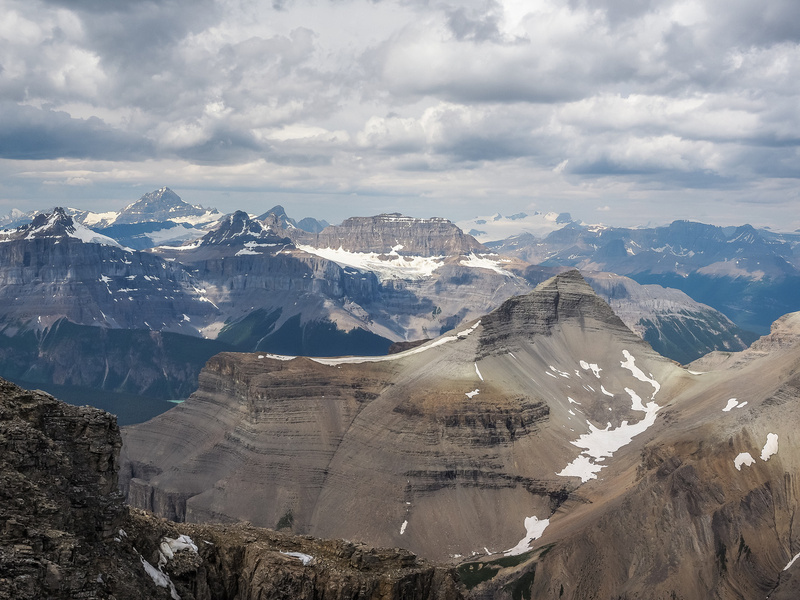 Back in 2015, Steven and I spent a few days scrambling Corona Ridge and Marmota Peak in this off-the-beat area of Banff National Park on the western edge of the Siffleur Wilderness Area. 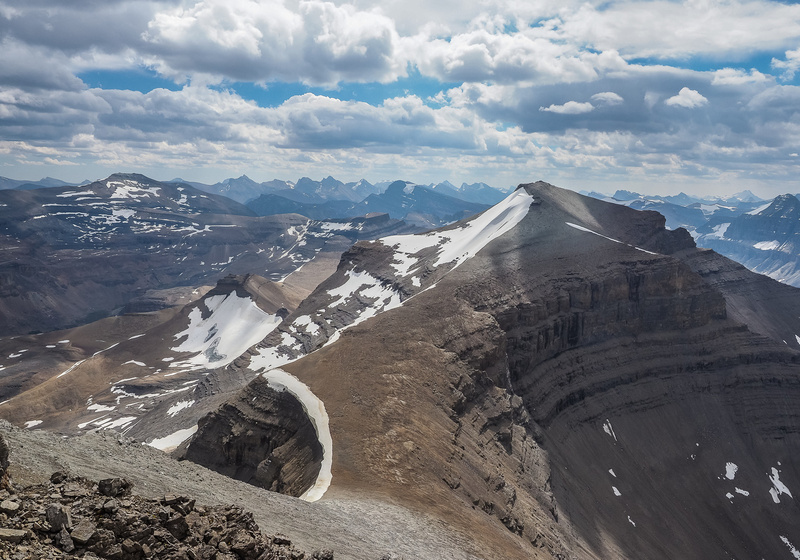 I remember looking up at both South Totem and Spreading peaks as we made our long traverse to Marmota Peak and thinking both of them deserved my attention. 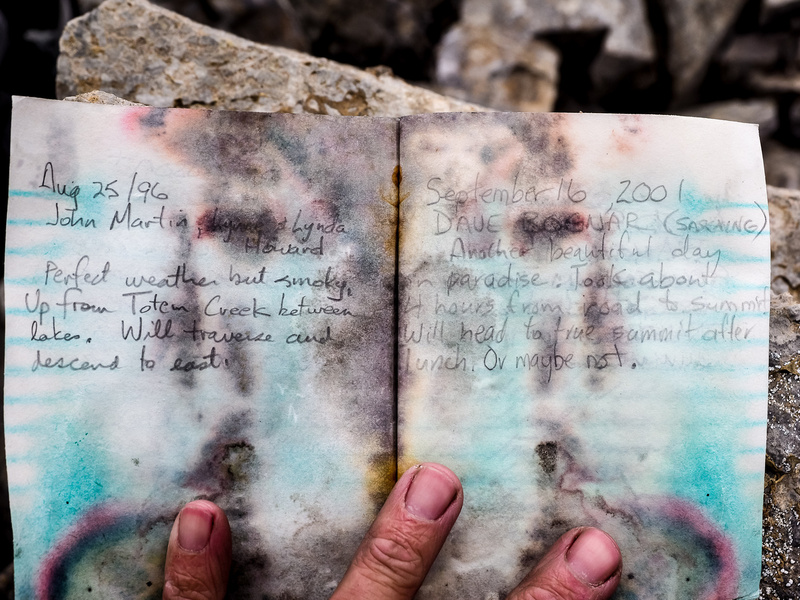 Phil read Graeme Pole and Bill Leach’s trip reports on Bivouac for the same two peaks years ago and put them on his to-do list as well. 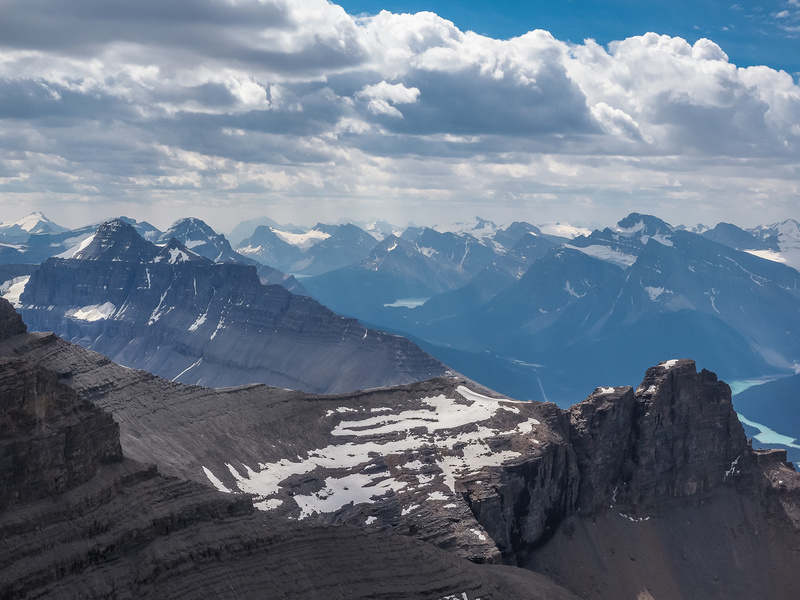 We decided it was time to give them a shot, considering that more and more people seem to be tagging remote and obscure summits that are on our lists lately (before we can get to them)! Bison Peak was also reported by Graeme and Wietse and I followed his description up that fantastic and easy peak back in 2013. 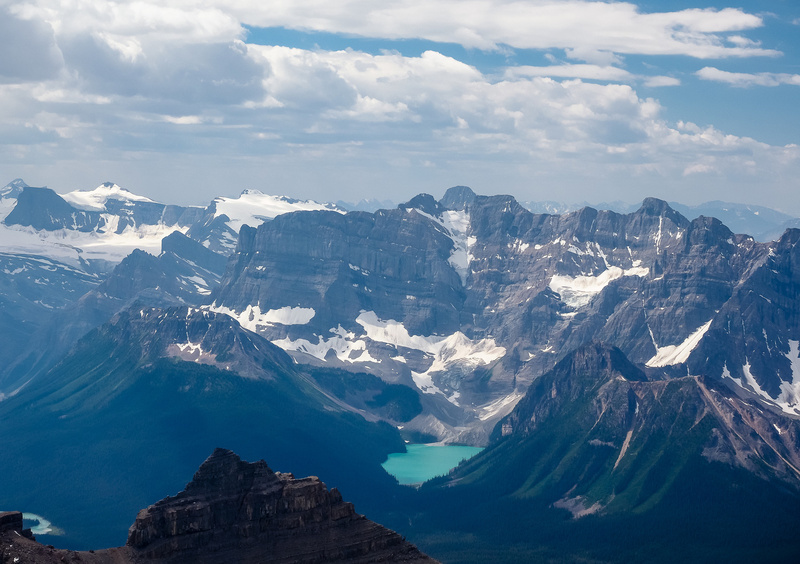 For some reason most folks seem to ignore this group of relatively easy peaks in the Murchison Group along hwy 93 that are easily doable in a day from the highway. I guess until they are made popular in a guidebook they will remain somewhat obscure. This isn’t a horrible thing, of course. Two things stood out for me when reading Bill’s report. The first thing was the elevation gain at around 1800m. That seemed like quite a lot for a 14km day trip – although their 12 hour day made sense with that stat. The second thing was that they didn’t actually reach the true summit of South Totem due to a snowy notch and they seemed to have a complicated descent to the Spreading Peak col down some cliff bands. I wondered how my legs would feel after the recent bashing I’d given them, but was excited for this day trip as I knew we’d have great views once we were above treeline. We decided on an early start due to possible afternoon tstorms. By 08:00 we were ascending the rocky drainage of Totem Creek off hwy 93. 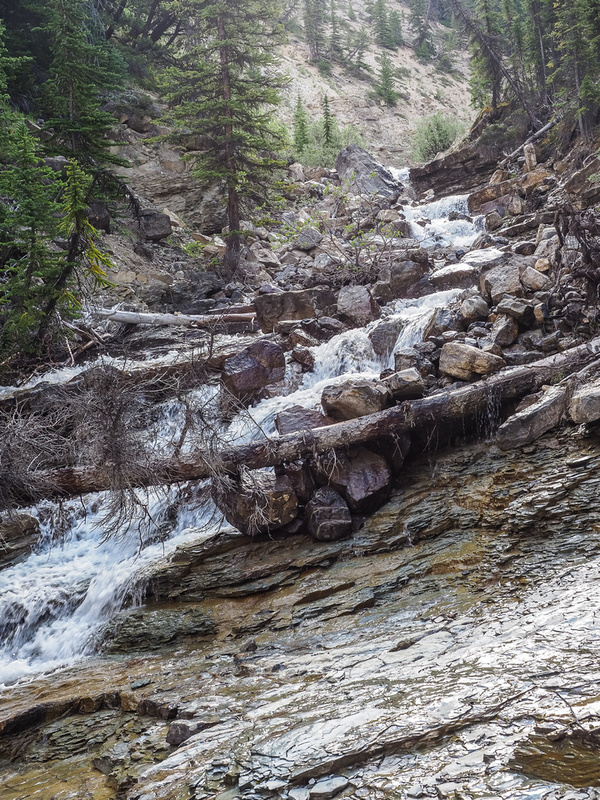 I remembered following smatterings of a trail high above Totem Creek and we soon found fresh blazes and ribbons on the north side of the creek. 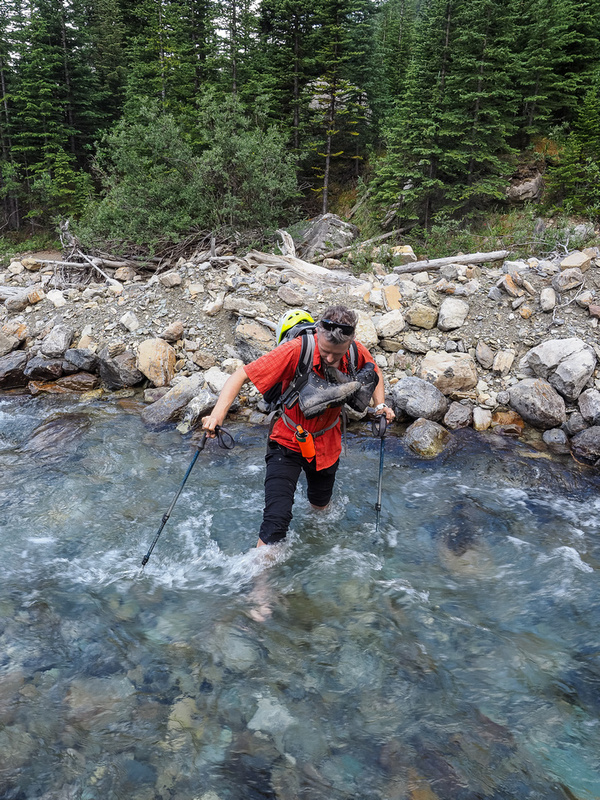 Following the fresh blazes, we both commented that the trail we were on seemed a bit closer to the creek then we remembered. Sure enough – when I checked my old GPS track against the blazed and ribbon-marked trail we were on, it was lower. Someone had put in a lot of effort to clear this trail and we followed it right up until the point where our planned route crossed Totem Creek. Making things very interesting was the fact that the trail also ended at this point! 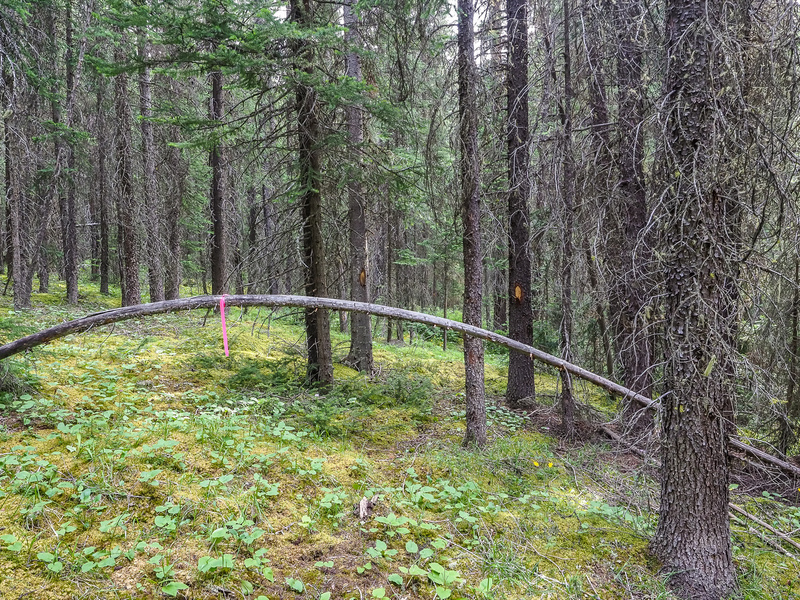 As a matter of fact, just at the spot we decided to cross the creek, a ribbon beckoned us into a drainage that led up towards South Totem Peak. Hmmm. Stranger things? Phil takes a breather after a very steep ascent out of the drainage below. To be honest, the ribbons continuing along our planned route was a little bit disappointing. 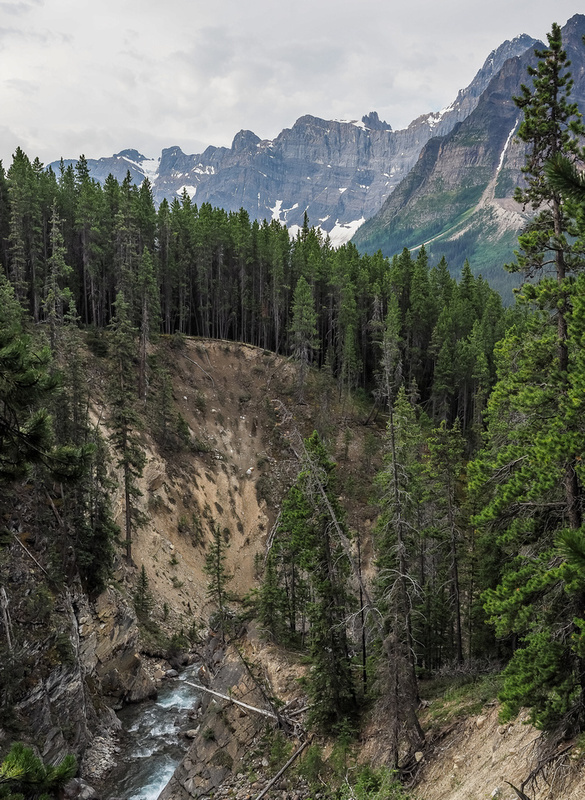 We had hoped to find that South Totem was rarely ascended – having a ribbon highway and trail to it’s base was not giving us the obscurity we were secretly wishing for! 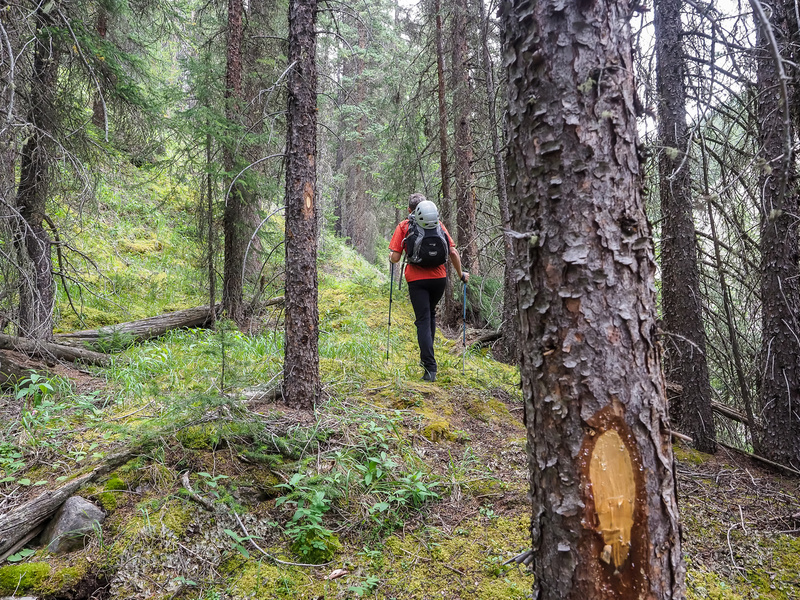 I remarked more than once that the trail reminded me of a similar one that Ben and I had followed into the relatively obscure Kerkeslin Lake area a few years previous. In that case we wondered if a local Jasperite had fashioned the trail and I wondered aloud if perhaps, this was the same person? 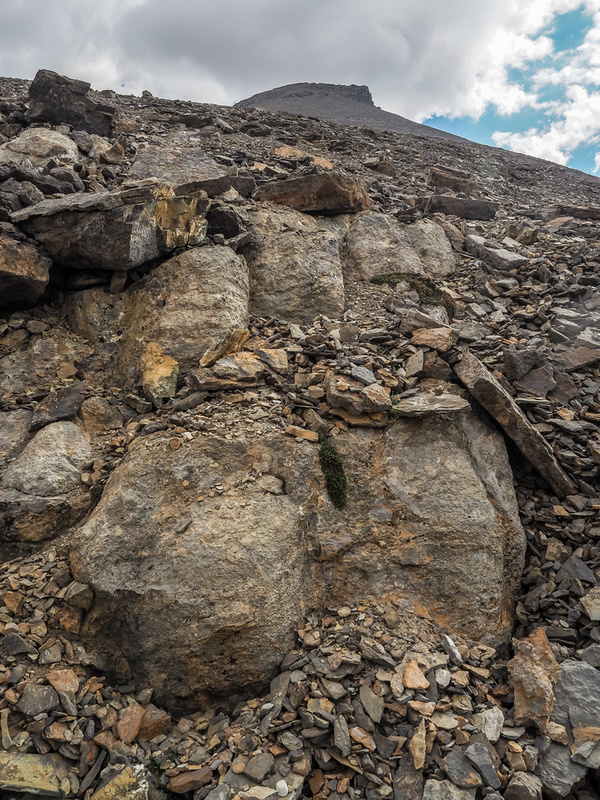 But why such a good trail to a relatively obscure pile of scree such as South Totem Peak? 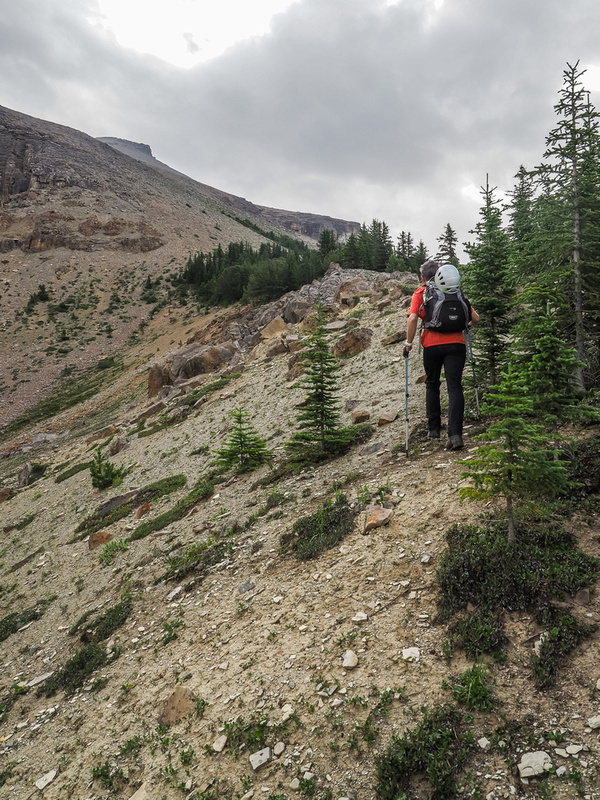 Surely there’s more motivation to forge a trail all the way to the Totem Lakes and beyond? A mystery for sure. 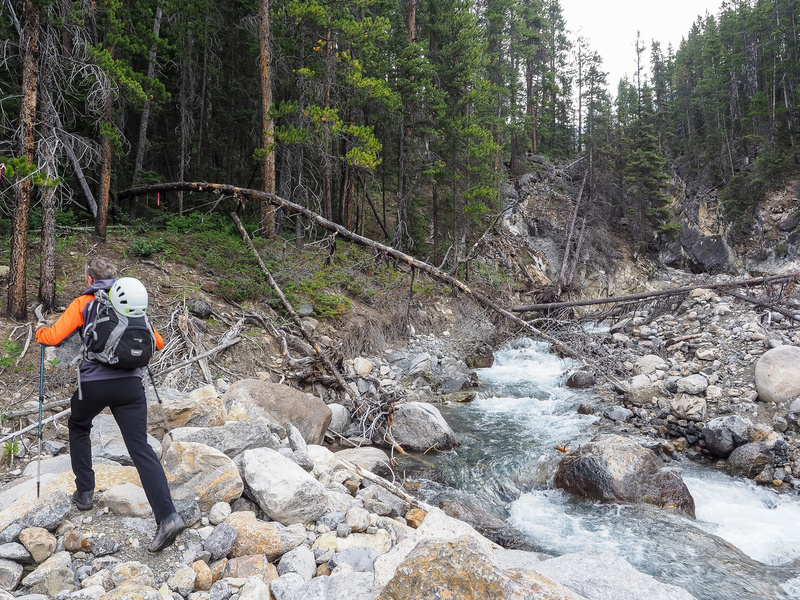 Thankfully for us, once we crossed Totem Creek and made our way to the pink ribbon, we quickly realized that there was no more blazes, ribbons or trail from this point onward. We were officially off grid now. 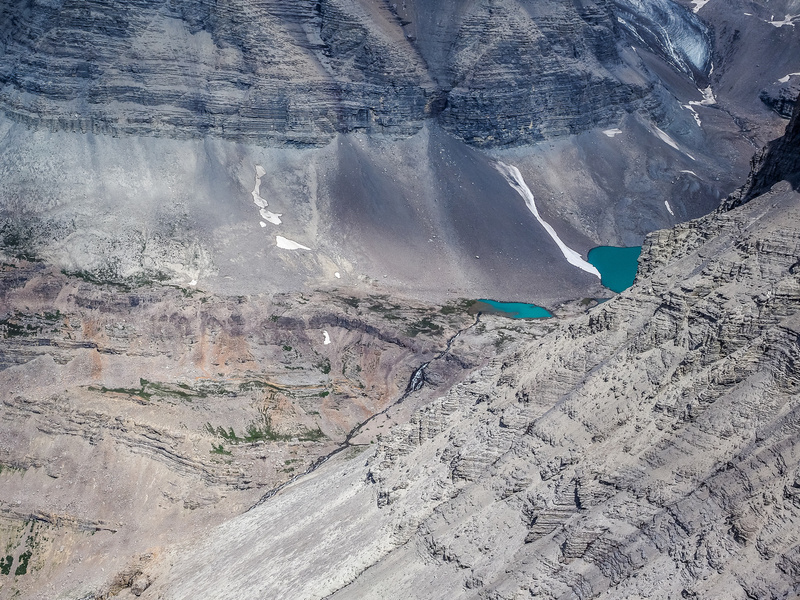 We followed our noses and Phil’s planned route across another drainage to the east (this one had running water) before finally breaking treeline and spotting the easy, open scree slope towards the false summit above. Endless piles of this. I did the whole thing in approach shoes and it wasn’t too bad, save a few very loose sections. As mentioned already – this slope is very foreshortened. At this point my legs felt awesome. Phil had set a furious pace up the forested part of the approach from hwy 93 and we were only about 2 hours into our day as I took over the pace setting and blasted up the easy scree slope towards the false summit. Views were awesome, as expected, and a cool breeze added energy to my tired body as we got high above a lovely hanging valley to the west. The Murchison Towers were impressive, as always. We knew we had to ascend higher than Bison Peak and I used that as my progress marker and motivation. Approximately 3.5 hours from the car, we were on the false summit of South Totem – much quicker than expected, but still feeling great. I immediately noticed that the east summit was definitely higher. 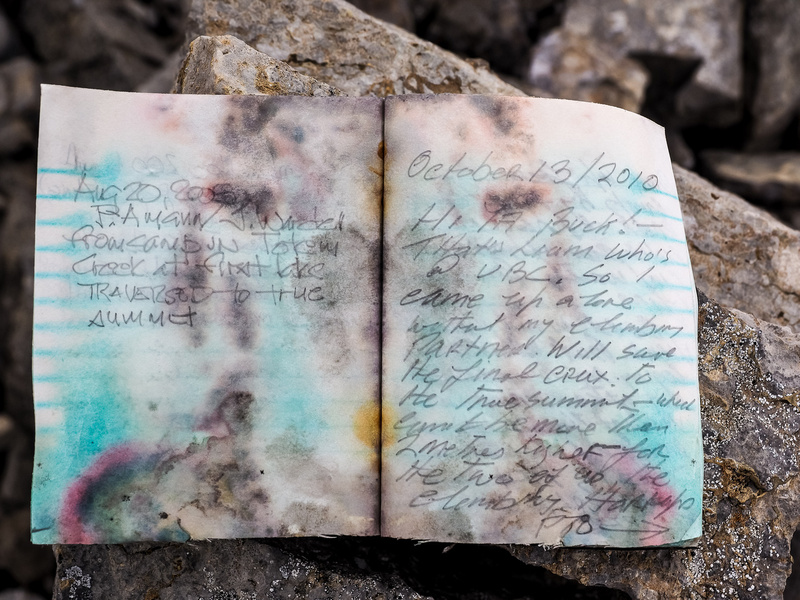 Without any hesitation I grabbed the ill-placed summit register (which was admittedly placed on the ‘wrong’ summit by it’s author) and headed for the true one. Views from the false summit clearly showing the higher true summit at left along with Spreading Peak at center. The manky notch lived up to its reputation. Despite the recent stretch of hot, dry weather, there was still a small snow arete that I had to deal with. Thankfully I could step on and across it as options to go down and around it were loose, exposed and limited. As it was, this notch was certainly the most difficult terrain we were on all day. We agreed it was moderate scrambling terrain in the relatively dry conditions we had. With snow or ice I could see that under-equipped parties could be turned back here. I quickly re-ascended loose, blocky terrain to finally stand on the true summit, which measured almost 2m higher than the west one. 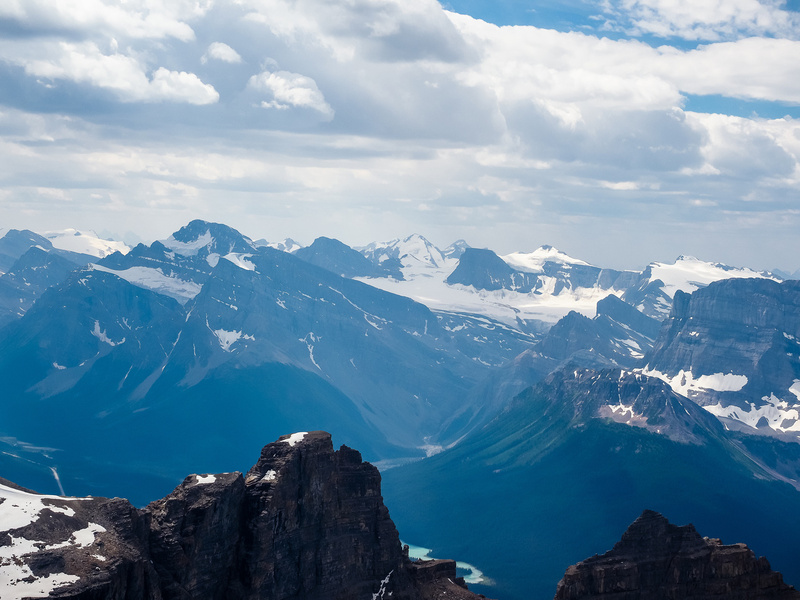 The register was quiet with about half of the parties not making the highest east summit. Views were, as expected, very acceptable. Corona Ridge and Marmota looked like big peaks from this vantage. I remembered having a severe stomach flu on Corona while trying to keep up with Steven the whole day – good times! Summit views include Phil down climbing into the notch and the lower false summit. Spreading Peak at left and Bison at right with Mount Chephren rising over the false summit in the distance at center. Graeme’s register entry is almost 30 years old. I think there was 8 entries? At least 3 of the parties admitted to not making it over to the east summit. Corona Ridge (L) is a beast of a mountain. Good thing I had the stomach flu when I did it on a hot day in 2015! To the right of center is Mount Peskett. Incredible views of the terrifying Totem Tower at left with Murchison in the background. Corona Ridge to the right of the tower and Marmota Peak at right. Incredible views north off the summit include (L to R) Chephren, Bison, Cromwell, Engelhard, Hall, Totem Towers and Corona Ridge at distant right. 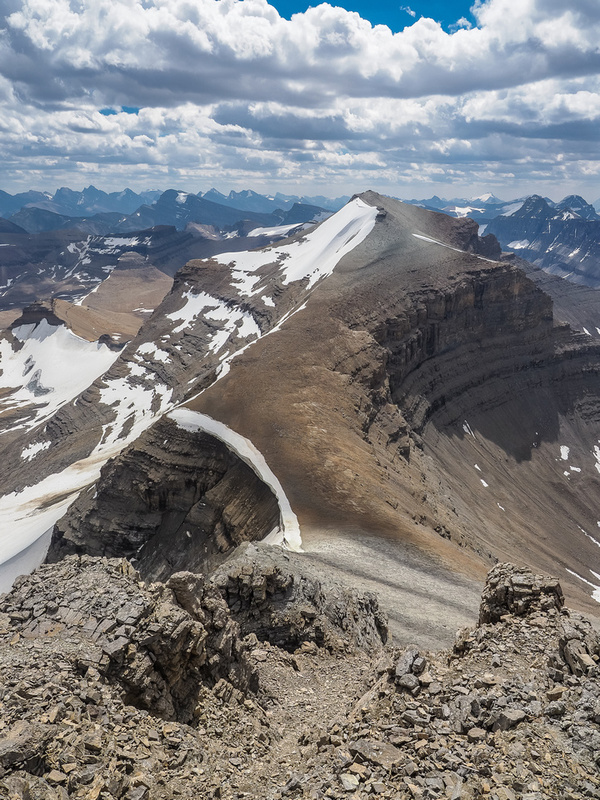 After a 30 minute break to hydrate and eat something, Phil and I turned our attention to the gorgeous ridge and summit of Spreading Peak, just to the SE of our position. 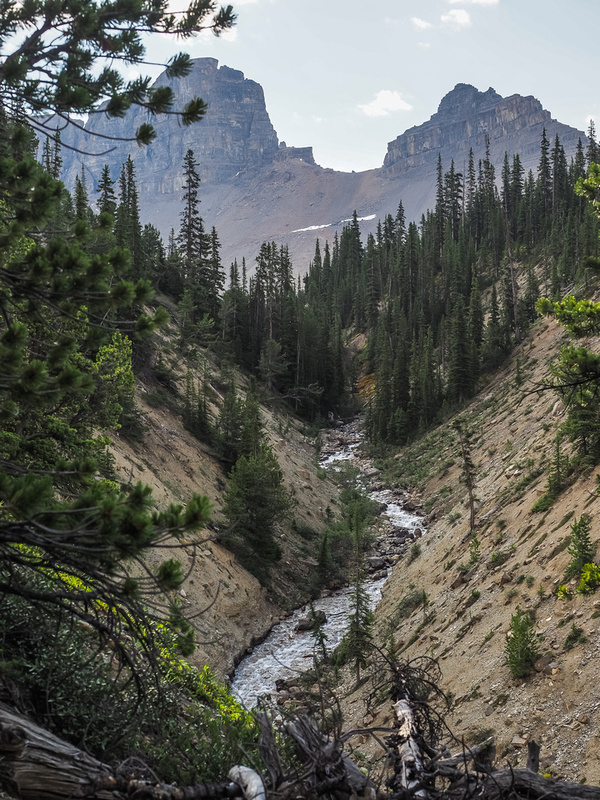 At first glance, the gullies leading down towards Spreading Peak from South Totem all looked fierce and foreboding. They were all loose, steep and precarious at best. I had a hunch, however, and proceeded to the far east end of the summit block where we got very, very lucky. A perfect angled and perfectly easy scree gully led down through the complicated cliffs on the south aspect down to the Spreading Peak col! It is so nice when a perfect plan comes together like this. It rarely happens, but I’ve been getting lucky lately. Leaving Totem Creek for the ribboned and blazed trail along it's banks. The blazes were still running with sap - they were quite fresh. 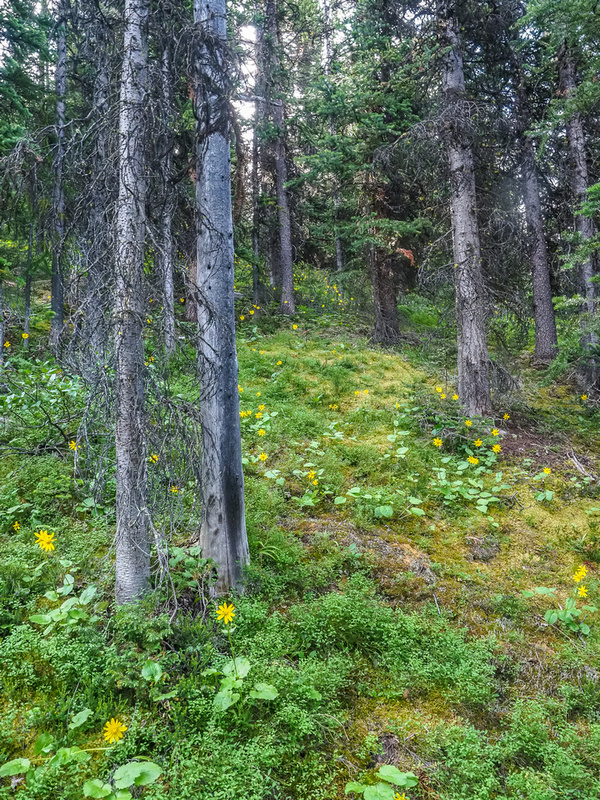 While the trail is still faint in spots there is a veritable highway of ribbons and blazes through the forested approach. We were one drainage too far south at first - we wanted the drainage with running water, which we had to cross here. Great views up the drainage with running water that marks the correct start to the lower ascent slopes of South Totem. Lovely forested slopes beneath the scree slope on South Totem. 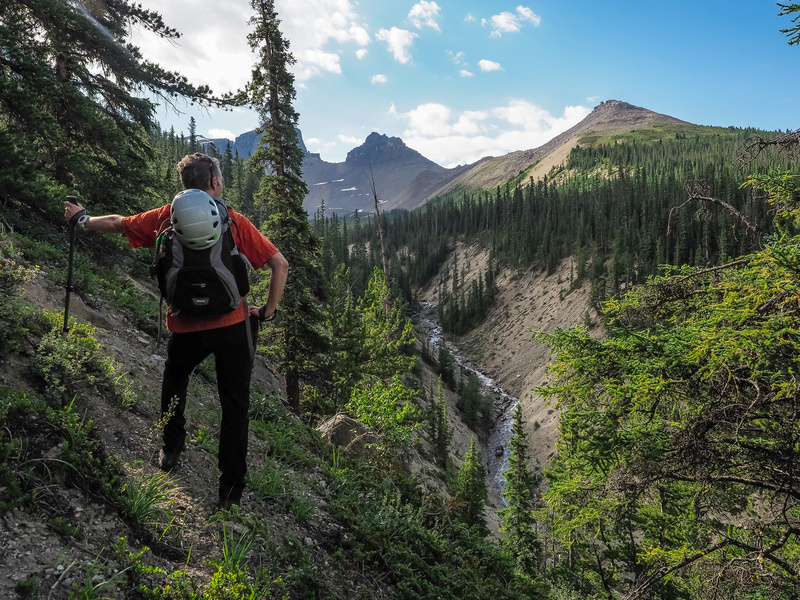 Phil checks out the views of some of Murchison's towers rising over Totem Creek. 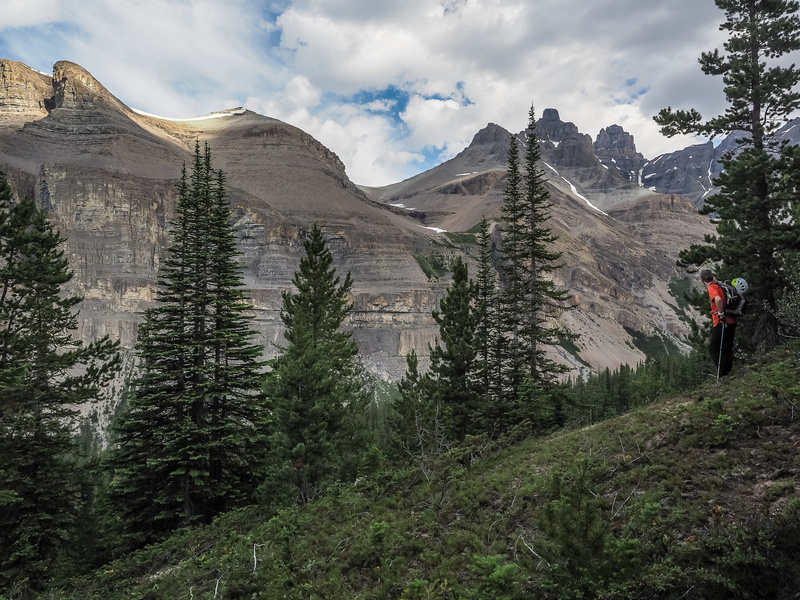 We skirt the forest just below the scree slope to South Totem's false summit. Endless piles of this. I did the whole thing in approach shoes and it wasn't too bad, save a few very loose sections. Chephren and Howse at left and Bison at right with Epaulette, Kauffman and Sarbach in between. Spreading Peak from near the false summit of South Totem. From the re-ascent to the true summit, looking back at Phil approaching the down climb through the notch which isn't visible here. From the summit ridge looking back at Phil who's starting the descent into the notch from the false summit. Spreading Peak at left and Bison at right with Mount Chephren rising over the false summit in the distance at center. Graeme's register entry is almost 30 years old. I think there was 8 entries? At least 3 of the parties admitted to not making it over to the east summit. Spreading Peak lies directly to the SE and looks very easy - other than the descent from South Totem. Midway, Stairway, Aries, Ebon, Breaker, Parapet and Barbette lie to the west across hwy 93. 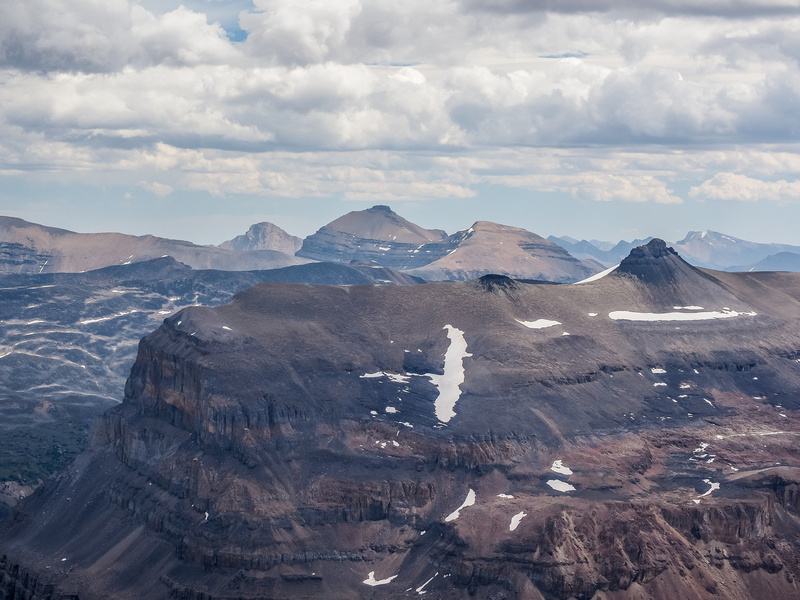 Mount Patterson rises at left with Mistaya and Barbette at distant center. Parapet at right distance. Corona Ridge (L) is a beast of a mountain. Good thing I had the stomach flu when I did it on a hot day in 2015! Looking over the ridge and a false summit of Marmota towards Siffleur Mountain and Mount Loudon. The obscure and distant summit of Marmota with the even more obscure and distant Abstruse Peak rising at distant right. Abstruse, Recondite, Augusta, Harris and Quill Peak (L to R) rise in the distance. Mount Murchison has many impressive towers - I believe this is Engelhard. 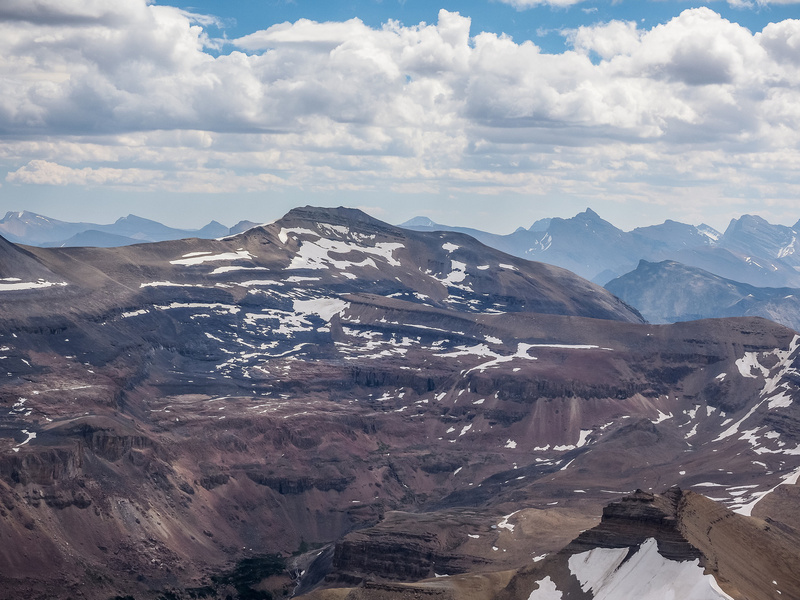 (L to R) Chephren, Bison, Cromwell, Engelhard, Hall, Totem Towers and Corona Ridge at distant right. Bison (Buffalo) Peak in the foreground with Epaulette, Sarbach, Forbes and the Lyells in the distance. 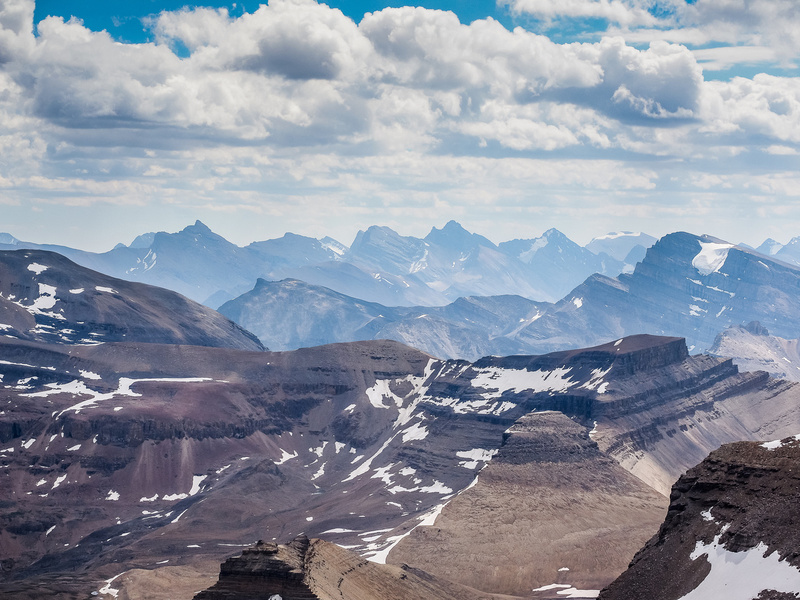 Distant views towards the Wapta Icefields with Mount Noyes in the foreground left. Phil traverses to the far east end of the summit ridge to find a break in the cliffs leading towards Spreading Peak (R). 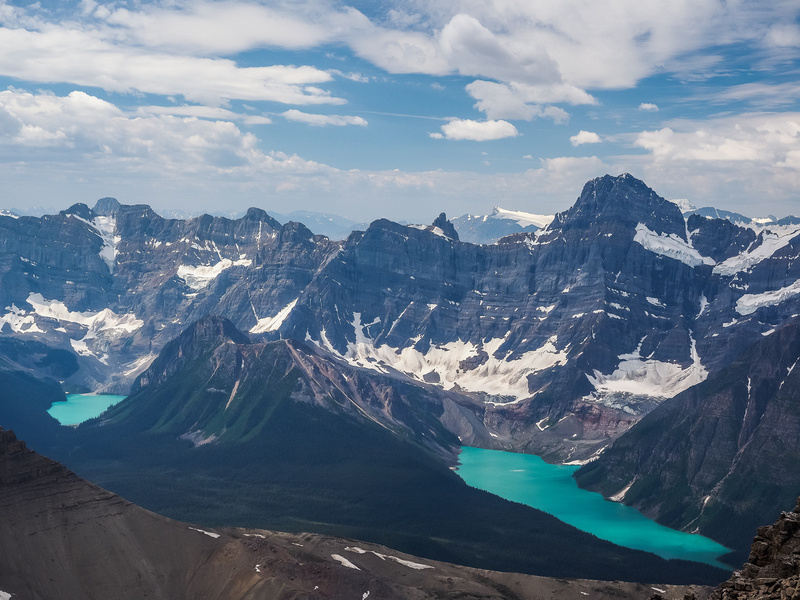 A glimpse of the lovely Totem Lakes - a hiking or backpacking destination that's well worth your time. Looking down the amazingly simple and easy gully to the Spreading Peak col and up the aesthetic ridge to the summit of our next objective.